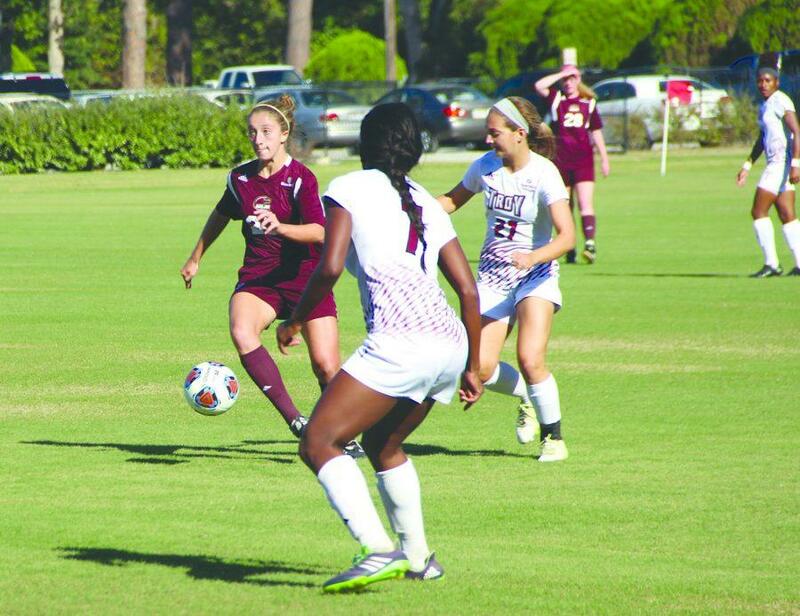 A quick goal by Troy in the opening minutes was all it took to end ULM’s seven game unbeaten streak at home. Despite the loss, coach Roberto Mazza appreciated his team’s effort. “We gave up an early goal on a deflected shot, and other than that it was a tight first half,” Mazza said. Troy held a slight 6-4 advantage in shots the first period while ULM held the edge in corner kicks 5-4. The Warhawks were led by senior Karlea Fehr offensively who put in a team high three shots on goal. With only 27 minutes left, a ULM player received red card disqualifying her for the rest of the game. After a red card is issued the disqualified player cannot be replaced, and the Warhawks were forced to play down a man. “It was unfortunate that we ended up playing down a man for the last 27 minutes of the game. Though in the end, I was very pleased with our team’s resiliency,” Mazza said. Despite the setback several chances materialized to even the score, but Troy’s goal keeper held steadfast. Freshman goalkeeper Brooke-Lynn Scroggins made nine saves in the loss including critical ones in the second to keep the game within reach. The loss marks the third to start off ULM’s nine game conference schedule to close out the season. The Warhawks will travel to Little Rock to face off against the Trojans Friday.